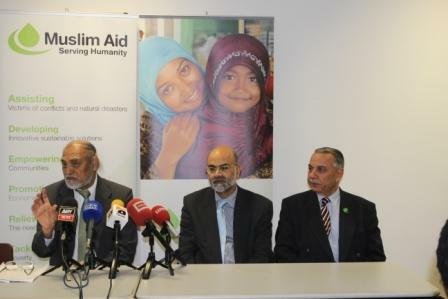 On Tuesday 19th November 2013 Muslim Aid trustee Mr Tanzeem Wasti briefed media at a press conference convened by Muslim Aid to support Punjab Governor’s initiative for clean water. Mr Wasti highlighted the problems people in Pakistan are facing due to lack of clean water and said that Muslim Aid has decided to help the efforts aimed at addressing the problem by providing water filtration plants at selected schools, hospitals and public places. The Governor of Punjab, Chaudhry Muhammad Sarwar called a meeting of Pakistan and British NGOs in Lahore on 5th November 2013 to seek the support of humanitarian organisations for his initiative. Muslim Aid has agreed to adopt Faisalabad district in Pakistan where it intends to provide 11 water filtration units. Muslim Aid has already installed two water filtration plants in District Headquarter Hospital and the other at Anjuman-e-Islamia Apna Ghar Yateem Khana(Orphanage). Muslim Aid has also installed 603 afi-dry hand pumps under its community led total sanitation campaign in district Mianwali, Bhakkar and Khushab. Under its Model Villages Project, Muslim Aid has installed 16 hand pumps at Mianwali, 37 at Jampur, 10 hand pumps at Charssadah and 17 at Daddu.